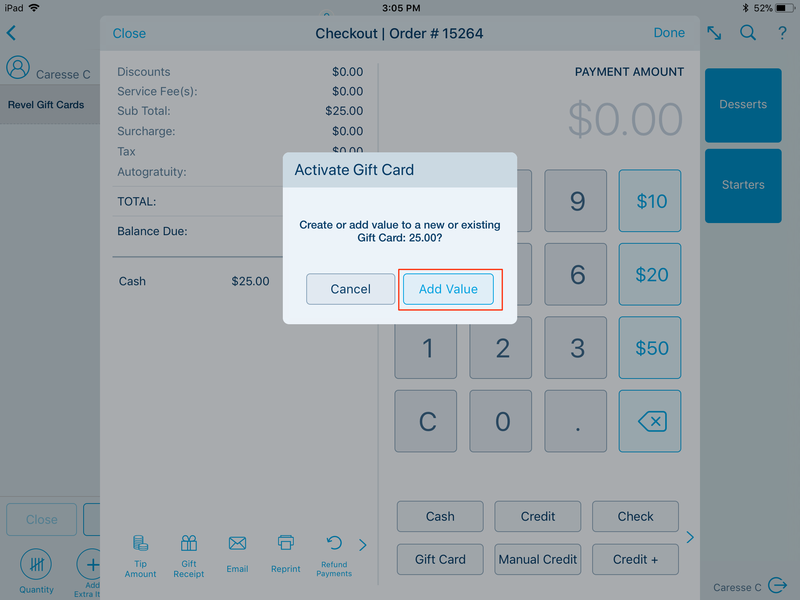 Revel Systems currently provides its own proprietary solution for Gift Cards. Revel Systems has also partnered up with other vendors that provide their own Gift Card solutions that are directly integrated into the POS. For businesses with multiple establishments, please note that Revel Systems' Gift Cards do not handle royalties. In other words, the establishment in where a gift card is purchased receives the full amount of the gift card, even if the gift card is redeemed at a separate location. For this reason, Revel provides a Gift Transactions report that shows the variance between establishments and allows merchants to keep track of a "central bank" and manually calculate royalties for individual locations. 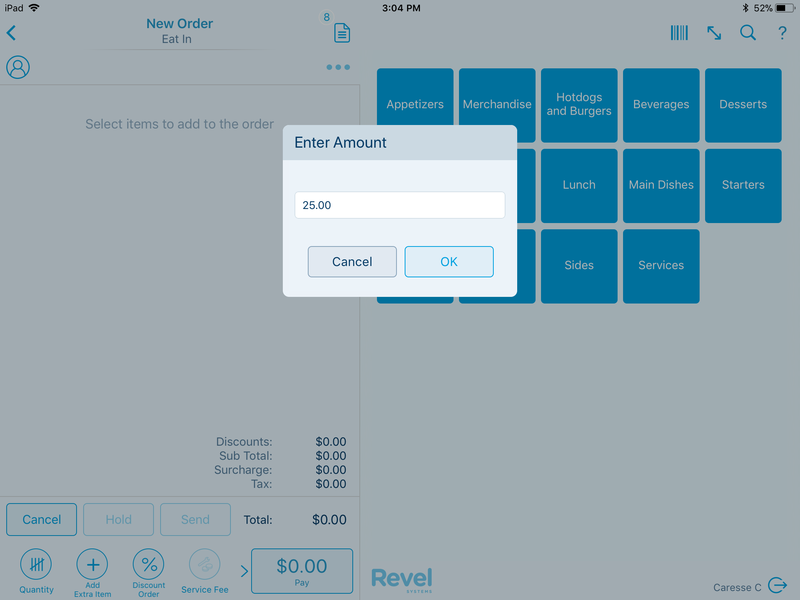 Revel Gift Card functionality can be purchased through your Revel Sales rep. Note: if you select one of our integrated vendors (e.g., Valutec, Mercury), the vendor will charge their own fees at their discretion for the functionality. 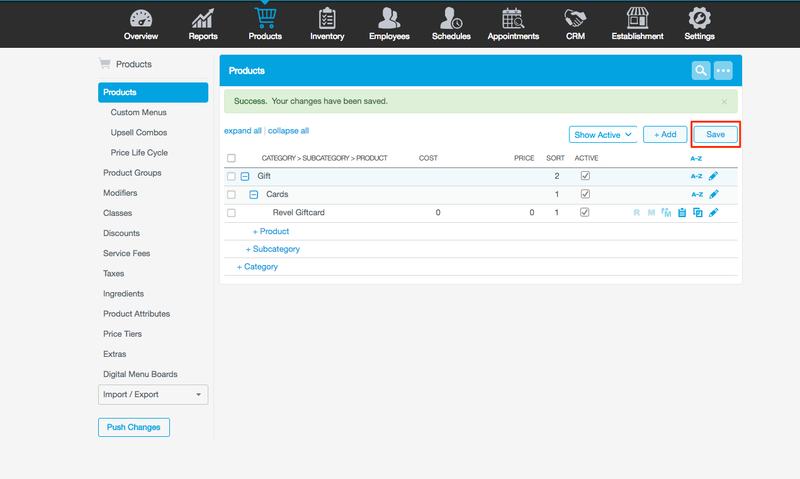 Before you can sell a gift card, you must create the gift card product in the Management Console. To do so, log into the Management Console. 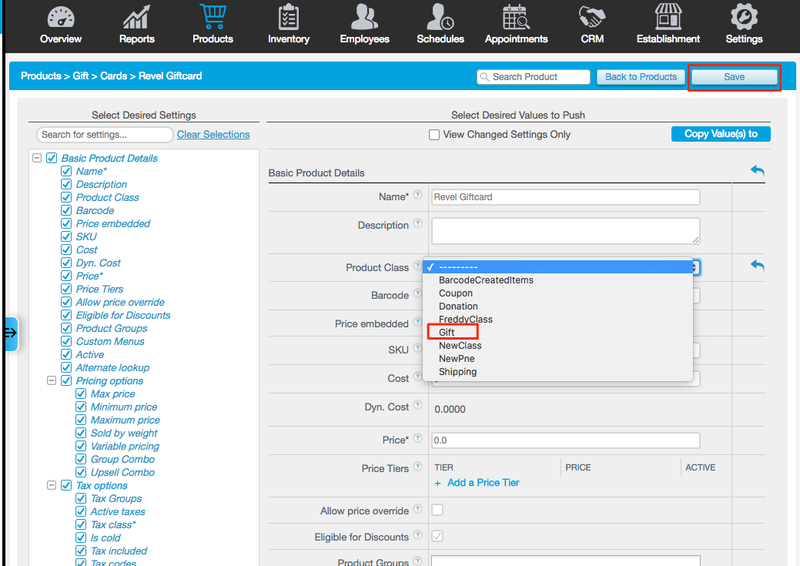 Under the Products tab, select the Category and Sub-Category where you would like the Gift Card to appear on the POS. On that screen, enter the name of the Gift Card product (usually “Gift” or “Gift Card”), and input the price that you would like to load the gift card for. If you would like the POS to prompt for a customizable price when selecting the gift card, please leave the price field at $0.00. Then click the Save button in the top right corner of the page. If you have existing gift card numbers, use Export/Import to create, update, or remove outdated gift cards. 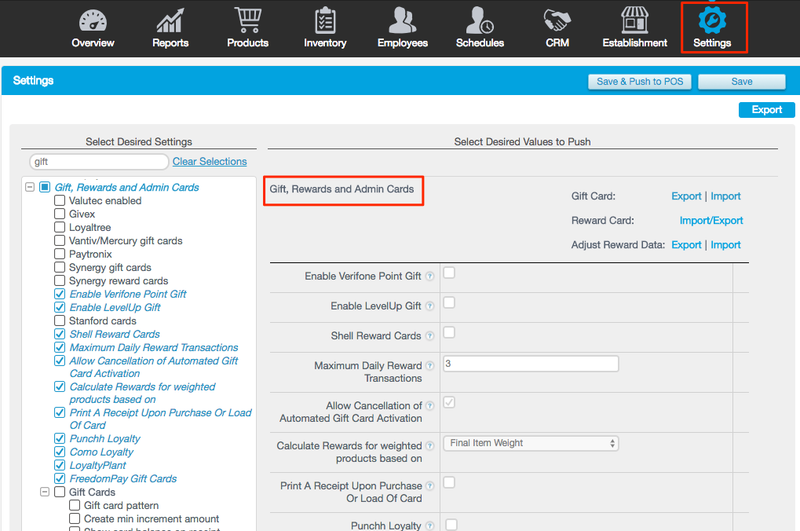 Under the Settings tab, find and select the Gift Cards checkbox. Select Export to download the gift card template. If you have existing gift cards created, this will also export a list of the gift card numbers. After editing the Excel file, upload the file using the Import button. You'll then receive an email confirming the import results. On the POS, select the category and sub-category where the Gift Card product was located. There, please tap on the Gift Card product to add it to the order. If the Gift Card was created with a price of $0.00, the system will prompt the employee to input the amount to be loaded onto the card. After the Gift Card is added to the order, hit Pay, and select the method of payment. Once the Balance Due reaches zero, the system will prompt the employee to create or reload an existing Gift Card with the selected amount. The POS will prompt Waiting for Card Swipe. Swipe the Gift Card or, if you need to make a manual entry, please tap on Manual, and manually enter the number on the gift card or certificate. To redeem a Gift Card, open up a new order, and add items to the order. Then, tap Pay, and on the payment screen, tap Gift Card. The system will prompt you to swipe a card or manually enter the card number. Once the system finishes authorizing the card, a pop-up window will appear with the message Payment Successful! If the amount on the Gift Card is greater than the balance due, the Balance Due will be reduced to $0.00. If the amount on the Gift Card is less than the balance due, the customer will be responsible for remitting payment for the remaining amount. To tender a certain amount on a gift card less than its full amount, enter the amount to be tendered prior to tapping the Gift Card payment method. Only the amount entered will be deducted from the Gift Card. When the balance due reaches $0.00, hit Done. 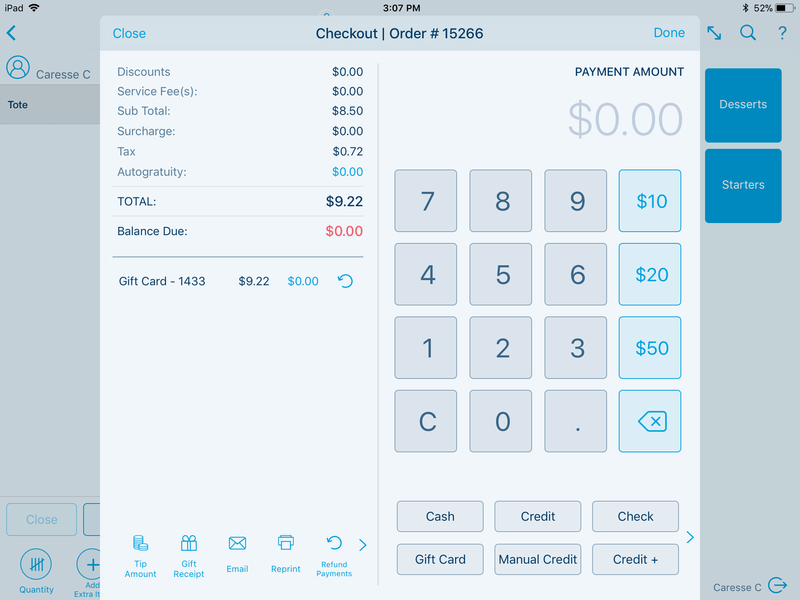 The amount remaining on the Gift Card will print on the receipt if configured on the backend. To verify, please log into the backend and go to Settings > Settings (Advanced) > Gift, Rewards and Admin Cards, and scroll down to Show Card Balance on Receipt. Make sure the box is checked. 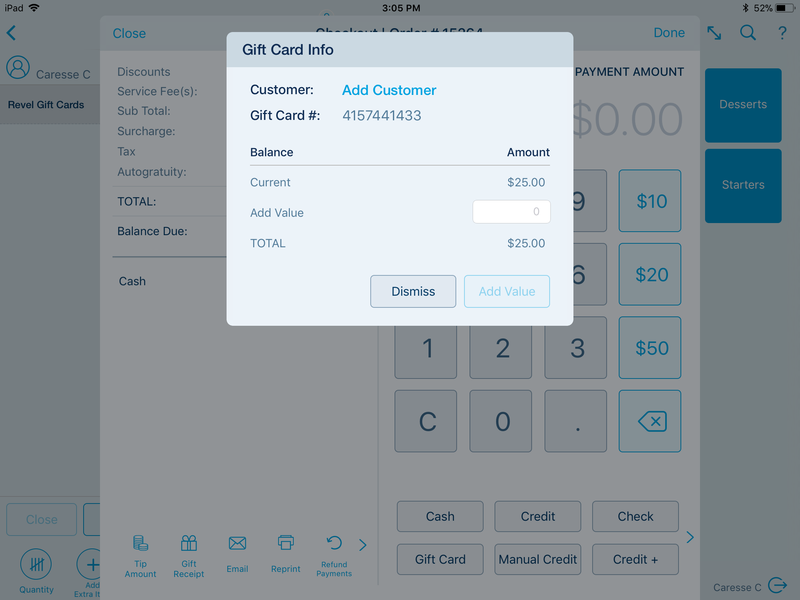 Revel Systems reports all Gift Card sales as Liabilities (non-revenue generating sales). 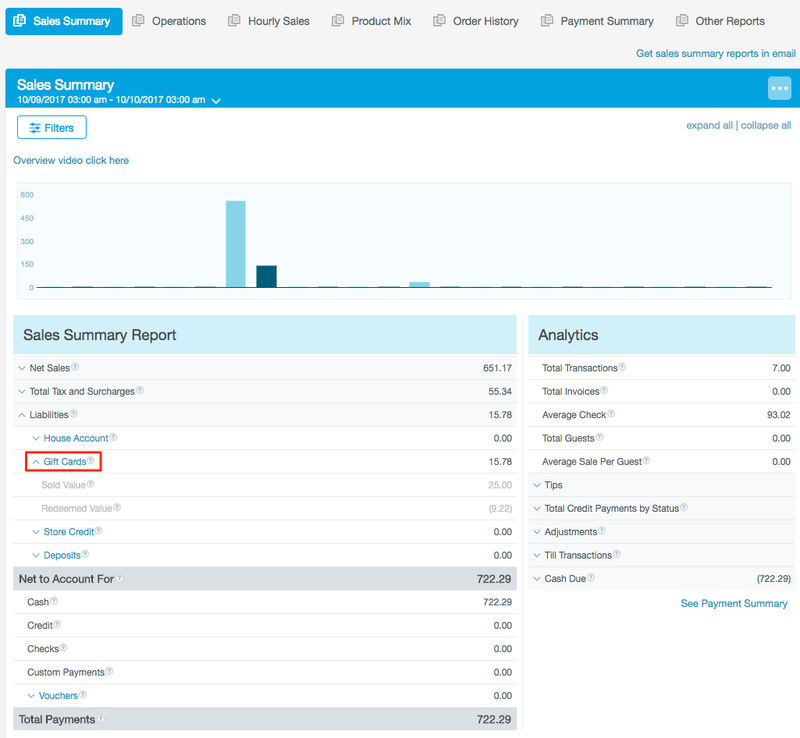 You can find this line item under Reports > Sales Summary. Any purchases made with a Gift Card will appear under the Payments section of the Sales Summary, as well as the Payment Summary Report. To view a report of how many gift cards are currently in circulation, go to Reports > Other Reports > Gift Cards. Please make sure to select a Date Range to view all Gift Cards that were activated during that time period. 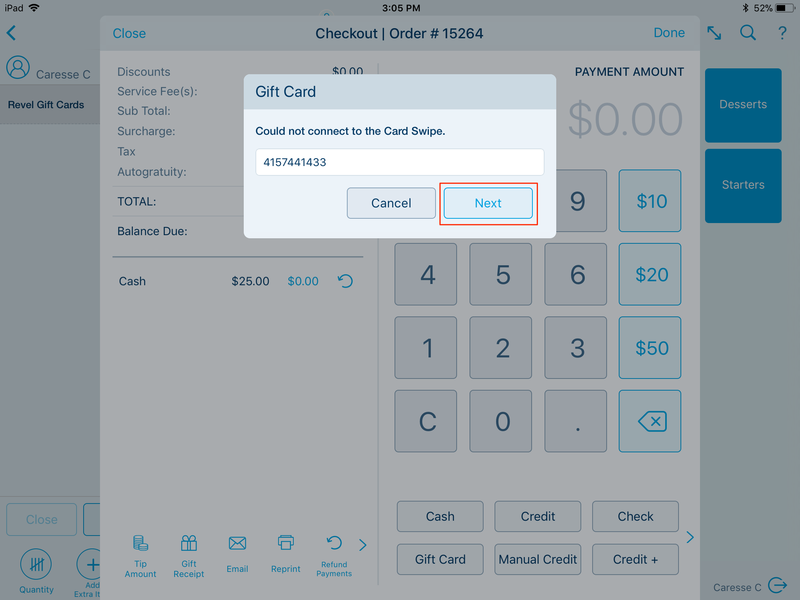 On this screen, you can choose to update the amount on a particular gift card (Note: you will not be receiving or refunding payment from the customer if you add or subtract an amount to/from the card). You can also print out a report in PDF format. If you would like to pull a list of all active Gift Cards in an Excel file, go to Settings > Gift, Reward and Admin Cards, and click on Gift Card: Export on the upper-right hand part of the screen.